If you don’t enter the tiger’s den, how can you catch the tiger’s cub? Ban Chao was born in Xianyang, Shaanxi. 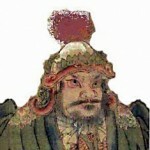 He was a Chinese general, explorer and diplomat of the Eastern Han Dynasty. As a Han general and cavalry commander, Ban Chao was in charge of administrating the "Western Regions" while he was in service. He also led Han forces for over 30 years in the war against the Xiongnu and secured Han control over the Tarim Basin region. He was awarded the title "Protector General of the Western Regions" by the Han government for his efforts in protecting and governing the regions.